With the inevitable weight of responsibility that comes with gaining access to major licenses such as Star Wars, Marvel, and Plants vs. Zombies, Zen Studios has done a magnificent job at putting together a host of tables for Zen Pinball 2 that do justice to some much-loved franchises. To give you an idea of what the full game entails, please check out our Zen Pinball 2 review. Otherwise read on as we examine the latest piece of DLC in the form of The Walking Dead table. At a basic level, the control scheme for Zen Pinball 2 simply involves tapping the DualShock 4 triggers to control the left and right flippers, using co-ordination and timing to shoot flashing lanes. Delve a little deeper into this virtual pinball simulator, however, and you’ll discover there’s so much more to it, with engaging missions to complete and interactive mini-games to enjoy. Throw in some lovingly-created themed tables and silky-smooth pinball mechanics and you’ve got yourself a game that has that perfect pick-up-and-play appeal. The Walking Dead DLC is the latest table added to the swelling roster of content on offer and focuses on events during Season One of Telltale Games’ classic point-and-click-adventure. 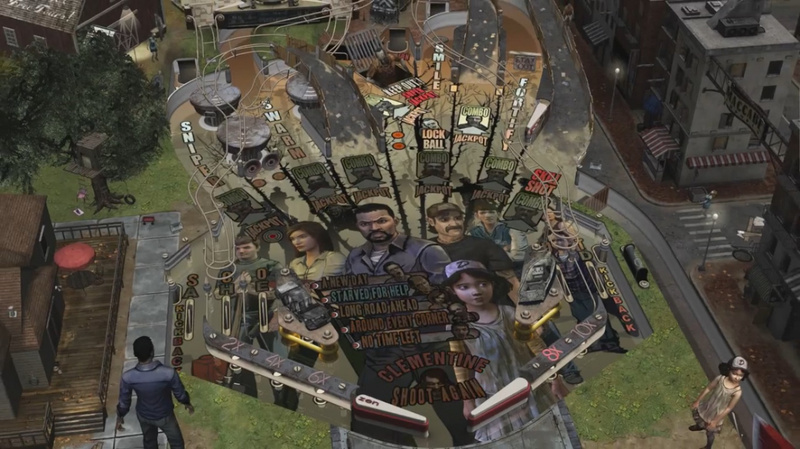 Not only does the pinball table look fantastic, thanks to key artwork (from The Walking Dead on PS3) used to detail some of the iconic locations and characters, but it also cleverly takes on board two of the main themes from the zombie-infested adventure: survival and moral choices, and does a great job at capturing the heart and soul of The Walking Dead universe. Housed around the outskirts of the pinball playing area are some of the iconic locations from Season One, complete with ambling Walkers for added zombie flair. You’ll spot the town of Savannah and the Travelier Motel, as well as Clem’s Treehouse and St. John’s Dairy. The typical pinball plunger is replaced by an axe, while the groans and moans of Walkers, the haunting chime of the Bell from the tower, and the verbal and physical interactions between the two main characters, Lee and Clementine, give the table the look, feel, and sound that fans of The Walking Dead will immediately identify with. Throughout each turn at the table, you’ll often hear familiar exchanges such as words of encouragement between Lee and Clementine, who are voiced by the original actors from Telltale’s adventure. What’s more impressive is that they are brought to life depending on your actions and skills on the table with the main source of entertainment coming via missions triggered by hitting the mission sinkhole ‘x’ amount of times. There are five missions to choose from, each corresponding to the five episodes from The Walking Dead console game, including ‘A New Day’ and the finale, ‘No Time Left’. Each mission begins with a morale decision needing to be made. Using either the left or right trigger, players must respond to questions such as, “Will you side with Kenny or Larry?” or “Will you look for help now, or wait until it’s night-time?” Whichever action you choose triggers a unique event that you have to complete in order to finish the episode and gain maximum points. For example, if you choose to save Duck (Kenny’s son) after being grabbed by a Walker, you’ll need to score a million points by hitting the spinners against the clock. While you attempt the challenge, some of the tension of Season One is captured through Lee and Clem’s activity at the foot of the table. You might see Lee, for example, trying to fend off a Walker which adds to the drama as you frantically try and hit the relevant lanes while the timer ticks down to zero. The moral choices you have to make don’t affect the outcome as intensely as in Season One of The Walking Dead adventure game, but they do affect the scenario you are set and the particular animations that you’ll see from Lee and Clem. In between missions, The Walking Dead stays true to its theme with a focus on morale building and survival. Among the tasks on offer, players are asked to scout ahead for Walkers by hitting a combination of lanes, and to hunt down food and supplies by visiting Everett’s pharmacy and using the second set of flippers to break through ranks of Walkers. There’s also an unlockable, enjoyable SNIPER side mission that takes you away from the table. It involves using the flippers to guide a target reticule to snipe down Walkers that appear through the windows of a building, and it is a welcome diversion and break of pace from the frenetic action of pinball. Each side game and main mission does a superb job at capturing some of the memorable moments from Season One, except for one. There’s one scenario that involves lighting up all the letters of the world SMILE by hitting the corresponding flashing lanes. The pinball then turns into a football. By hitting the correct lanes, you can bring a much-needed grin to Lee and Clem’s face, and watch as they pass the ball between each other at the foot of the table. Personally, I feel this particular scenario could have been replaced with something a little more engaging and relevant to the adventure; kicking a ball around isn’t something I remember at all from Season One. Nevertheless, this minor oddity doesn’t do anything to distract from what is a brilliantly-designed and enjoyable pinball theme which ties in superbly with Telltale’s console game. And, of course, you get everything that you’d expect from a Zen Pinball 2 table, with the ability to trigger lock-ins and multi-balls, score skill shots and rack up combos. In my review, I described Zen Pinball 2 as “the definitive and smoothest running iteration of this addictive simulator” and The Walking Dead is an excellent addition to a roster of tables that is over-flowing with quality and a core title that has addictive hidden depths. The Walking Dead table does its job at including the survival and morale-driven themes of the console game and delivers yet another expertly produced addition to the addictive virtual pinball simulator.